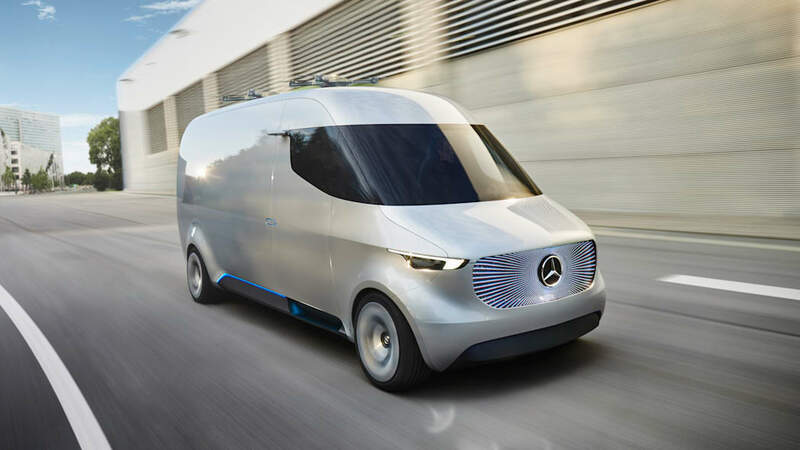 Today in Stuttgart, Mercedes-Benz pulled the wraps off a concept that it hopes will allow the commercial vans division of the company to branch out into logistics and delivery. 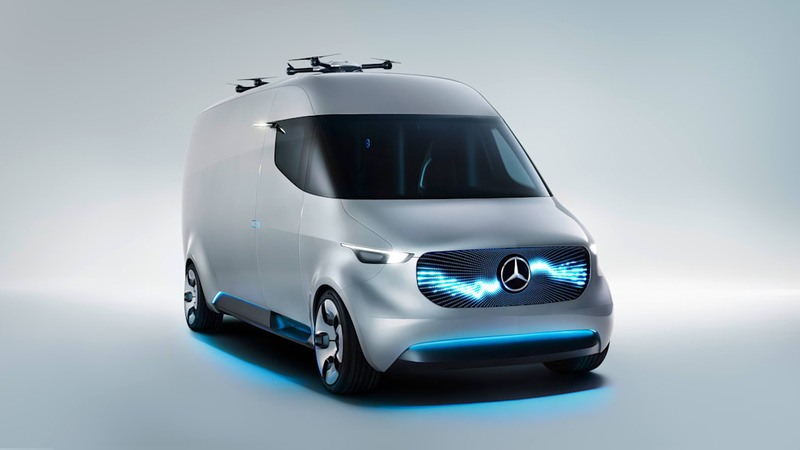 Think of it as the kitchen sink approach: not only does the van have every of-the-moment gizmo imaginable, it also represents an entirely Mercedes supply chain from warehousing to final delivery. 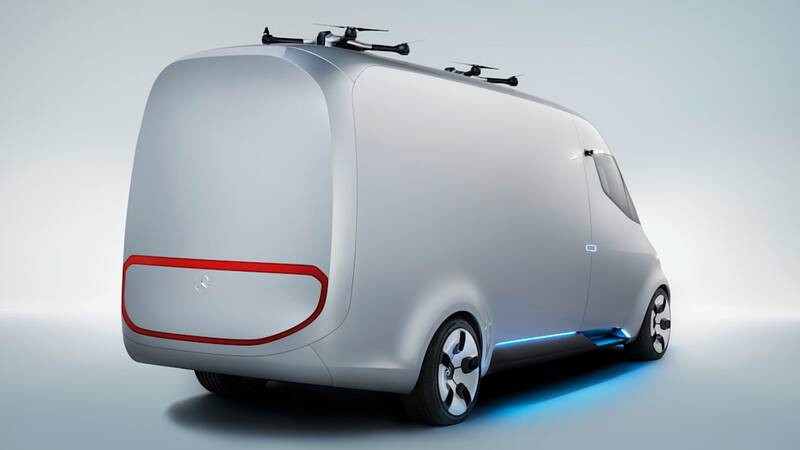 Oh, and it has a couple of delivery drones on the roof. That's so very 2016. 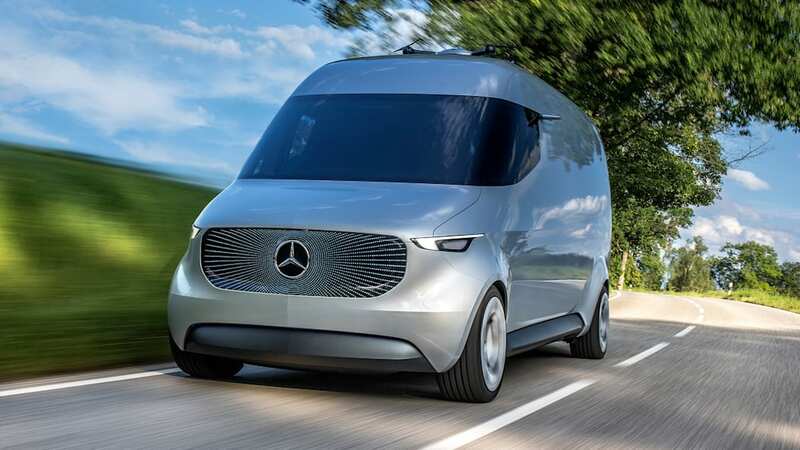 Mercedes calls it the Vision Van, which sounds a lot like something you'd see parked at an Arby's with a mural of a wizard riding a dragon on it. There aren't any murals on the big, blank, plain slab sides. 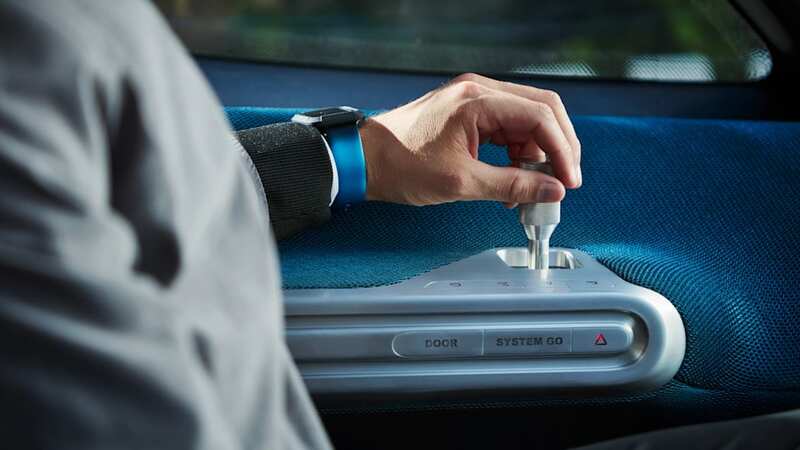 Think of it as more of a collection of preexisting ideas brought together in an integrated system, or a particularly new vehicle idea, and you're on the right track. It's bringing all this stuff together that's the interesting part. 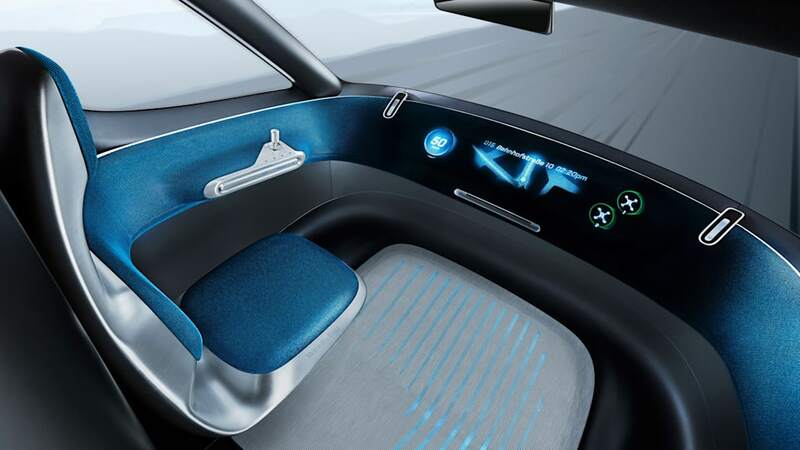 After all, you've seen concept vehicles with joystick controls and plenty of fully electric city vehicles already. 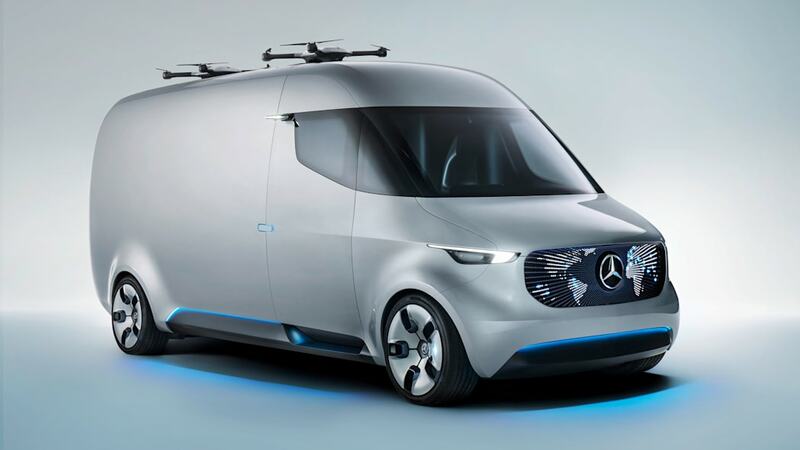 The basic premise is that Mercedes will sell, lease, or even rent on demand the capacity in both the storage and delivery system, but also vans much like this concept themselves. 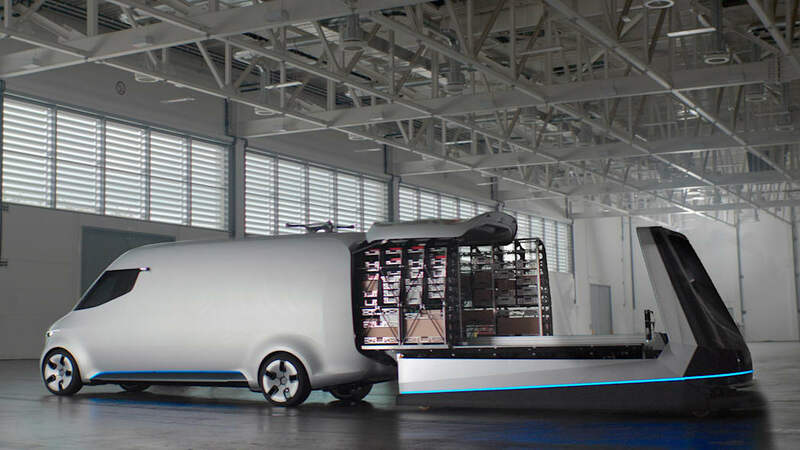 The company doesn't feel strongly about the ownership model in this instance, because it can make a lot of money convincing buyers to adopt its system wholesale. 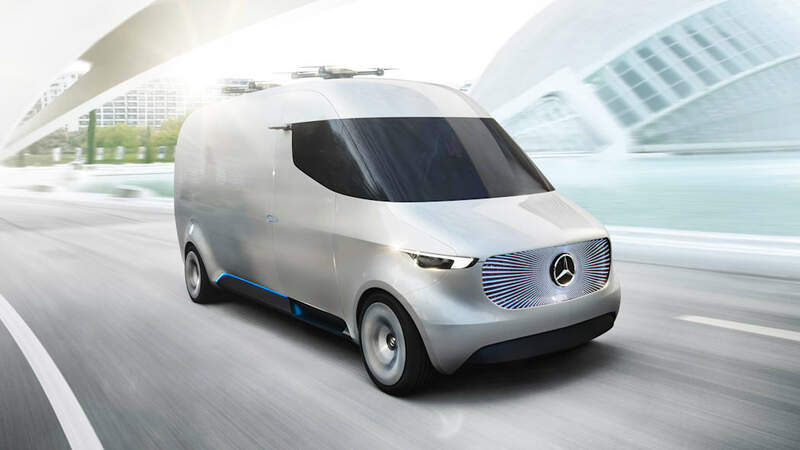 In return, Mercedes is offering both a turn-key solution and multiple gains in efficiency over a partially-networked logistical system. 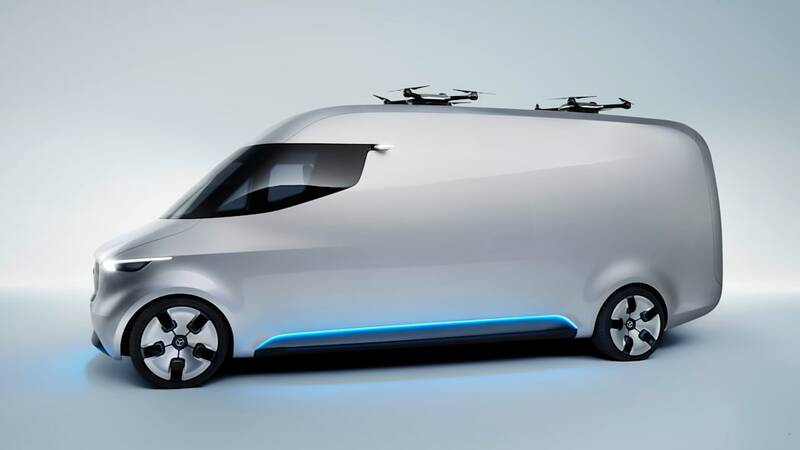 The Vision Van concept itself is a battery-electric vehicle intended for dense urban delivery, with about 100 horsepower and a range of just under 170 miles. Ignore the drones; the really neat stuff is in back. 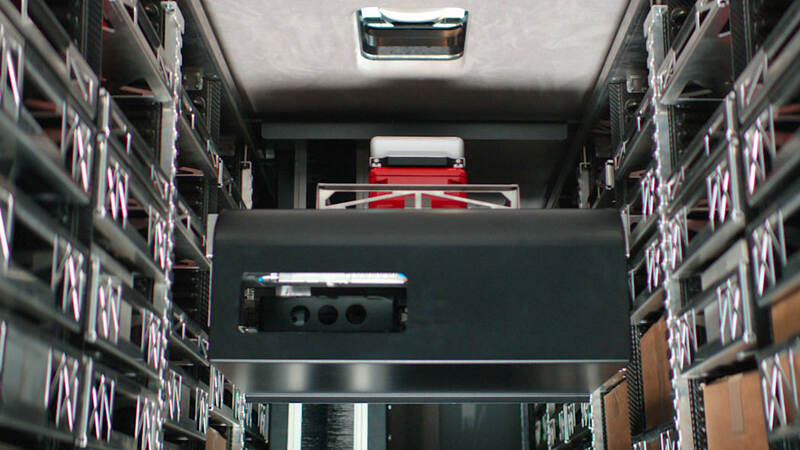 There's a "one-shot" loading system, essentially fitted smart racks that slide into the cargo area robotically. 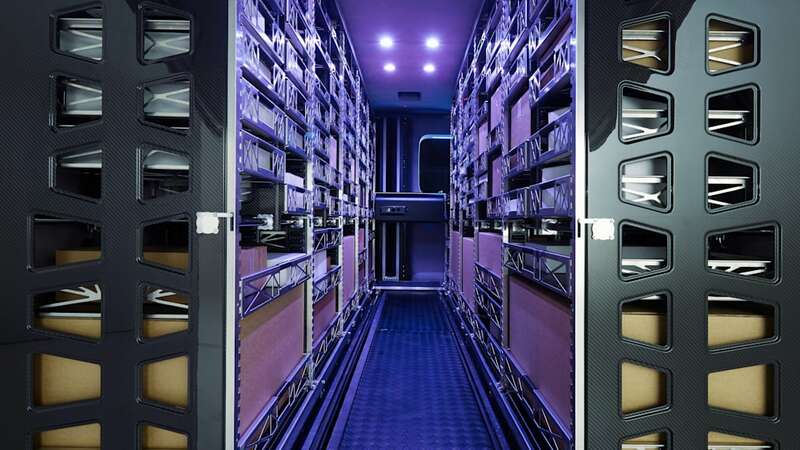 At the delivery location, the rack with the package maneuvers itself automatically to a pass-through just behind the driver, preventing time lost both loading the van efficiently and repacking the cargo area to get the packages ready for the next delivery. 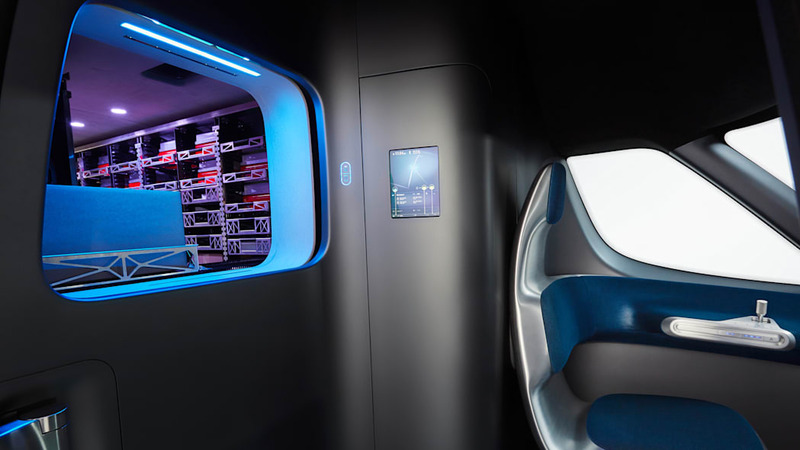 When it's done, the robot slides out the rack and slides in the next one. The robot loader isn't quick, but this is all a concept anyhow. 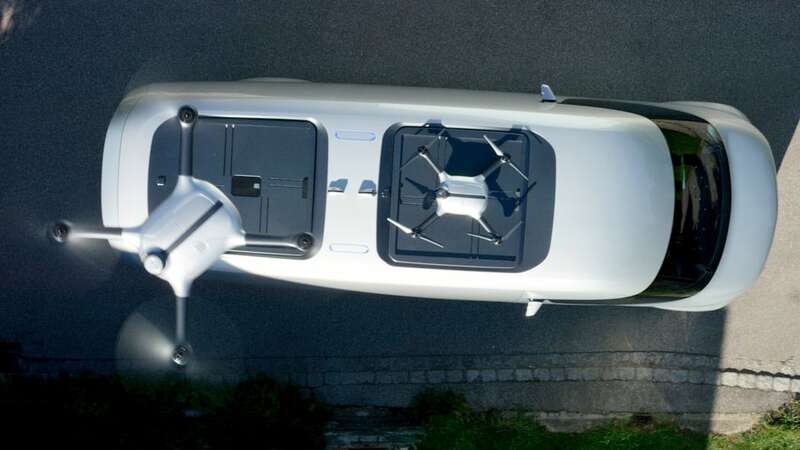 The precariously-perched rooftop drones look neat, and they also are loaded automatically through a port in the roof. 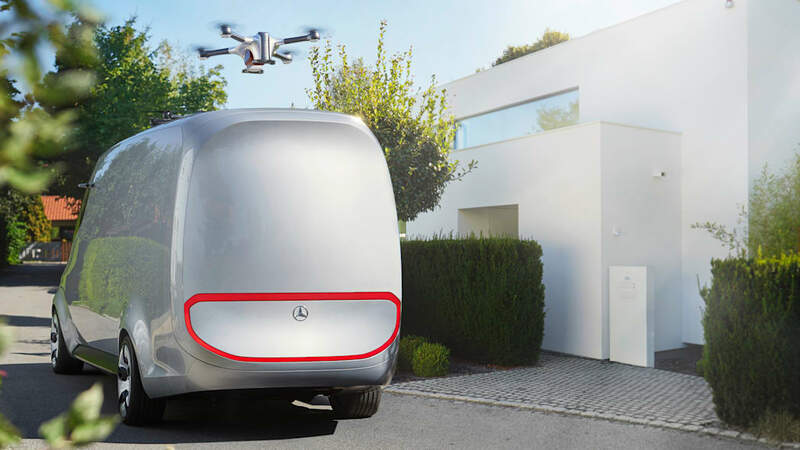 It's an interesting idea to have delivery trucks serve as mobile drone carriers and probably the most gee-whiz feature here. 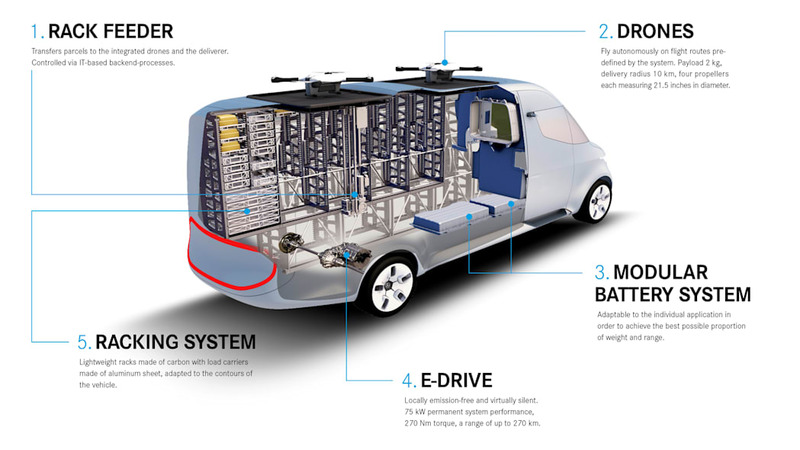 As long as this hypothetical supply chain eliminates humans at the distribution center and in the air, why have a human in the Vision Van at all? 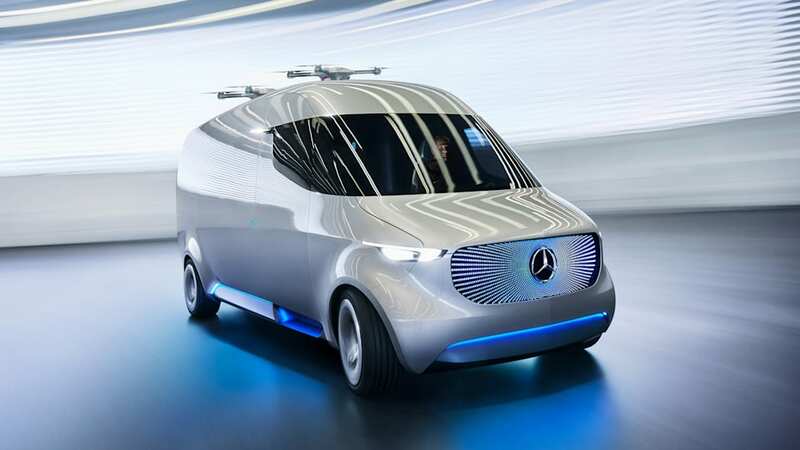 That seems to be the next logical step for the fully-autonomous logistical network of the immediate future. 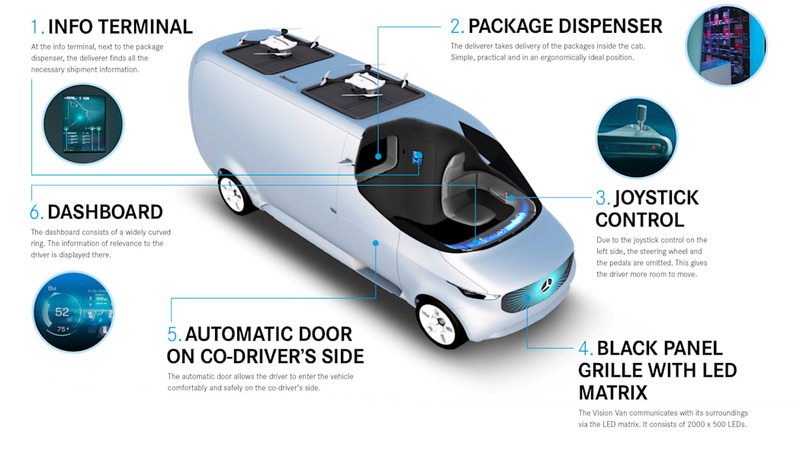 We'll look back on the Vision Van in 20 years and laugh that it had a seat for the delivery person at all. 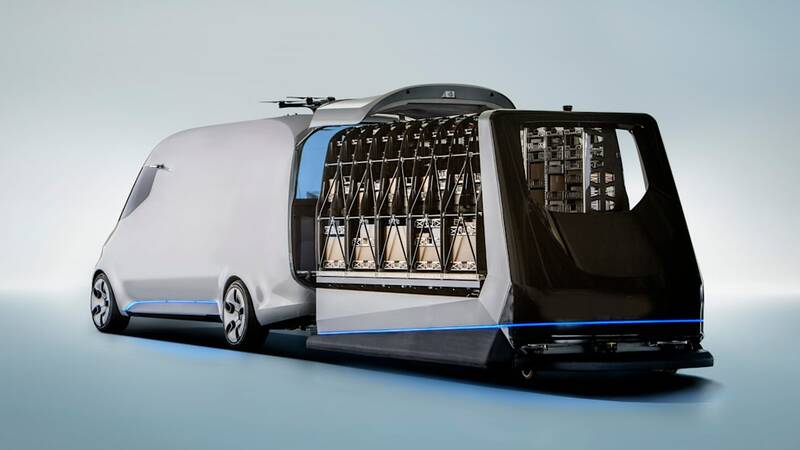 Until then, don't expect to see this particular van launching drones around your neighborhood soon – it's just a concept, but not a far-fetched one.